The markets remained flat this week with a negative bias. Tech giant TCS reported its numbers for the year & while the profits beat expectations, there was disappointment on the revenue and margin front. Global commodities such as Zinc & Lead hit multi-month lows. Results of IndusInd Bank & Yes Bank were declared. Yes Bank numbers shocked investors due to huge additions in Non-Performing Assets. This raises some concerns over corporate governance, accounting policies and has caused a minor loss of Investor confidence in the Company. The bad news for Sun Pharma continues as the USFDA pointed out data integrity issues in the Dadra Plant. Results of Index Heavyweights HDFC Bank & TCS were declared. HDFC Bank reported an 18% increase in Net Profit, accompanied with an increase of 21.5% in Net Interest Income. The minutes of the meeting of the Monetary Policy of the Committee revealed contrasting views, though with an increase in bias of a rate hike later in the calendar year. Correction of the past 2 weeks seems to continue and gather pace. 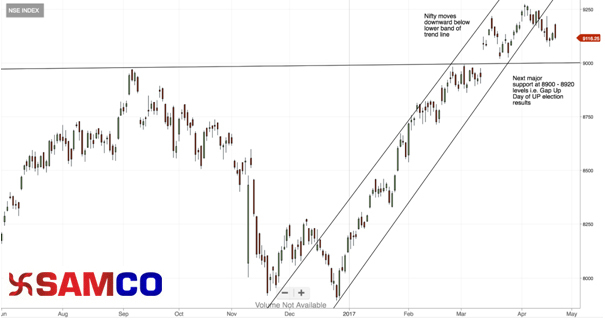 From a medium to long term perspective, the NIFTY could fall to 8900 levels, filling the gap that was caused due to the unprecedented victory of the BJP in the Uttar Pradesh Assembly elections. Traders should stay in the side lines and fresh longs should only be initiated only after a break out above 9250 levels. Markets can see an increase in volatility on account of the expiry and declaration of results by a bunch of Companies like Indiabulls Housing Finance, Reliance, Ultratech Cement, Axis Bank, Wipro, Kotak Mahindra Bank & Maruti among others. The market continues in its resting zone. The S&P 500 has also remained flattish for the past month. In absence of any definite trend, traders should remain on the side lines. Investors can continue to hold on to their investments & track indices closely. The NIFTY closed the week at 9119.40, down 0.34%. The markets remained flat throughout the week preparing to enter into the results season. Numbers of IT Bellwether Infosys were a mixed bag for investors, as the company reported a disappointing 2.86% drop in Net Profit while announcing distribution of higher dividend pay outs and Rs.13,000 Crores by way of Share Buy Back Program. US President Donald Trump’s remarks of the US Dollar “becoming too strong” saw a sharp fall in Greenback. It seems that the decade old policy on US dollar will undergo a dramatic shift from a stronger dollar to weaker dollar potentially threatening many business models across the world. Commodities like Gold also saw a sharp rise as Gold hit a multi months high. The Supreme Court ruling quashing the compensatory tariffs to Tata Power & Adani Power has added uncertainty to the power sector that has already been reeling under debt. The Gujarat HC recommendations on de-notifying the Union Territory of Daman and merging it with Gujarat to make the liquor ban effective in the state does not bode well for the Liquor Companies. Many more states are promising to make their states liquor free. Whether this is a political rhetoric or will become reality, only time will tell. The Infosys board's announcement to distribute Rs.13,000 Crore back to Shareholders in the form of Buybacks and Dividends shows that many IT Companies are finding it difficult to get better opportunities to deploy cash effectively. Society of Indian Automobile Manufacturers -SIAM reported that Rs.5,000 Crores worth of unsold BS3 Inventory still lies with Manufacturers despite the heavy discounting. The merger between Cairn India Limited & Vedanta Limited has also become effective, creating a natural resources behemoth in India. The correction path seems likely continue for a while now. No meaningful correction had visited the market since last few months. The upward velocity had already weakened a weak go as was visible by small trading days on the way up. The zigzag movement in the Nifty 50 indicate that these are correction times and no big reversal of the underlying up trend. Traders should book profits and stay on the side lines till market corrects by time by few more days. President Trump's intervention in Syria last week and recent pronouncement on North Korea is a complete reversal of his election stance. A “warning” was issued by North Korea to target Mainland United States with Nuclear Bombs. Such threats of Nuclear Warfare can weaken the power of bulls worldwide. Indian markets were intoxicated with greed since last four months, any type of geopolitical disturbances now can easily create fear across the board causing markets to correct. There are lot of uncertainties plus the results season on the horizon, market would therefore not travel north in a hurry for now. Investors can wait and watch but hold on to their investments. NIFTY closed the week at 9150.80, down by 0.51%. Markets opened gap up and broke the strong resistance at 9200 on back of constant FII buying which has even continued in the new fiscal year. The big event of the Week was the RBI Monetary Policy Meet on 6th April, wherein the Monetary Policy Committee unanimously agreed to keep Repo Rate unchanged, but hiked the reverse repo rate by 25 Basis Points from 5.75% to 6%. This will give a big respite to banks especially to PSU Banks that are sitting on huge liquidity which will now make them earn more by 25 Basis Points. This will also compensate for the losses incurred due to the rising bond yields. Newly appointed Chief Minister of Uttar Pradesh fulfilled the election promise of waiving off of over 36,000 Crores of farm loans. This flies contrary to prudent fiscal discipline as highlighted strongly by the RBI Governor. Considering the size of Indian banks loan waiver will not have deep impacts for the long term. Airstrikes by American Forces on Syria caused a spike in oil prices. This was unexpected change of stance from US President Trump on Syria which earlier he had refrained to interfere during campaigning. However markets across the world reacted maturely and has side stepped the issue at least temporarily. The merger of SBI and Associated banks went through in record time an unheard practice from the government machinery. This will lead to a round of consolidation among other banking players too. The velocity of the market is slowing down with small movements occurring on each successive up days. This is an indication of fatigue in the market, but considering the longer term bull market cycle that Indian market is currently witnessing; these bouts of weakness, slow movements and stock specific movements shall continue to play out. Short term traders should trail their long bets at 9150 and stay away from the market if it falls further. However major support continues to be at 9000 in Nifty. The next big trigger for the markets will be the annual & Q4 results starting next week. As we are trading at 22.2 Times Trailing Twelve Months P/E, the market does not appear cheap. Investors should focus more on individual stocks & avoid taking aggressive market bets. IT heavyweight Infosys will kick start the result season. The market is not expecting any meaningful growth because of appreciating Rupee & niggling worry of US H1B Visa policy. However Infy is trading at 15 times TTM Earnings, any positive surprise can take the stock to higher levels. Investors should wait for a while before restarting their systematic investments in quality stocks. NIFTY50 closed the week at 9198.30 down by 0.27%.